Bullying is an important topic we regularly refer to during our Taekwon-Do training. Our aim is to create more awareness about the problem and teach children to have the courage and confidence to identify, stand up for themselves, understand why it happens and have strategies that best deal with the problem safely and peacefully. 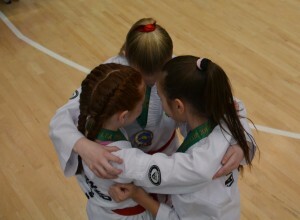 Taekwondo Students are expected to be respectful to each other at all times in accordance to the tenets of Taekwondo. Unacceptable physical contact such as pushing/shoving, banging/hitting/spitting or any other uncalled for physical contact (that is not accidental). Any bad language, aggressive behaviour/body language, verbal intimidation or put downs to another student. Deliberate excessive contact in sparring activities. Anybody who misuses the art of Taekwon-Do during and outside normal training times. A one off incident does not define a bully. We all make mistakes and any child who misbehaves in any form will be asked to stand out of the class on the ‘time out’ mat, reflect and apologise for the ‘uncalled for’ behaviour. We encourage all students to inform us or their parents of any incidents that occur during Taekwondo training as we may not always be able to identify it in a busy training hall. Any major incidents will be recorded at the back of the child’s attendance card. If we find a child is bullying another, and it occurs on a regular basis, we will contact the parent or the guardian of the child in question so that the parent can talk to their child about their behaviour and why it is not acceptable. If it continues, then we will ask for the child to be removed from the Taekwondo classes for a period of time or on a permanent basis depending on the severity and consistency of the incidents. We ask for all parents to work with us in helping your children resolve these problems.